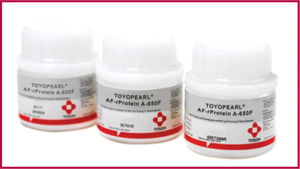 Features: Tosoh Bioscience introduces a new website and brochure featuring the Toyopearl resin portfolio for French-speaking scientists. The website overviews materials of construction and provides links to company information. The brochure covers all aspects of biochromatography for method development and larger-scale applications: size-exclusion chromatography (SEC), ion-exchange chromatography (IEC), hydrophobic interaction chromatography (HIC), and affinity chromatography (AFC) including protein A. Small prepacked Toyoscreen columns for rapid method development are also presented. 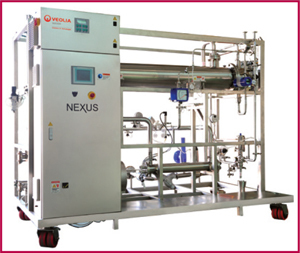 Features: The Nexus range of standard, packaged, prevalidated water distribution systems offer flow rates ≤30 m3/h. The hygienic design and fabrication in 316L stainless steel are fully compliant with GAMP, ISPE, CGMP, and FDA requirements. Conductivity monitoring, temperature control, and a loop flow meter are included, with optional TOC and ozone monitoring. Sanitization is by UV–ozone or 85 °C water (121 °C for WFI). The skid-mounted package reduces lead times and speeds up installation and start-up. Features: Vetter offers two efficient and user-friendly dual-chamber systems for complex compounds that require lyophilization. Lyophilized drug resides in one chamber, diluent in the other, and the drug is reconstituted just before administration. The Lyo-Ject and V-LK systems also can be used for liquid–liquid or powder–liquid drug combinations. 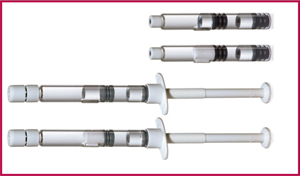 Syringes come in 1-mL, 2.5-mL, and 5-mL sizes covering fill volumes of 0.1–5 mL per chamber. Cartridges of 1.5-mL size accommodate fill volumes of 0.1–1.4 mL in the first chamber and 0.1–1.3 mL in the second. Features: MUSA’s Validated Cloud service is a fully qualified, audited, and FDA-compliant cloud computing source. It is governed by the US FDA’s CFR 820 quality system regulations, for which no previous options were available. This gives biomedical companies their first cloud option for their compliance systems and data storage. The off-site, Internet-accessible, qualified private storage environment is secure, scalable, and available worldwide. Templates and packages ar designed to create efficiencies without sacrificing quality. MUSA also provides qualification consulting. Features: DSM has introduced a proprietary technology called the Kremer Method to improve MAb downstream processing. The method reduces processing and preparation times, labor and materials requirements, and cost of goods for more sustainable manufacturing platforms. It uses in-line dilution to streamline MAb purification and polishing into a single, continuous step in a flow-through mode. This eliminates the need for storage and reduces the amount of material such as buffers and resins needed. Host-cell proteins have been removed to a level below the limits of detection; complete aggregate removal is observed; and recoveries of 90% were achieved. Features: Founded by scientists and engineers from major biopharmaceutical companies, Oncobiologics offers a one-stop proof-of-concept service for biologic developers and their preclinical drug candidates. Services begin with cell and molecular biology, then go on to process, analytical, and formulation development; stability studies; and nonclinical manufacturing and QC testing. Clinical manufacturing will begin in 2012. Partner offerings include preclinical animal studies, immunogenicity studies, clinical trial design and execution, and regulatory affairs services.